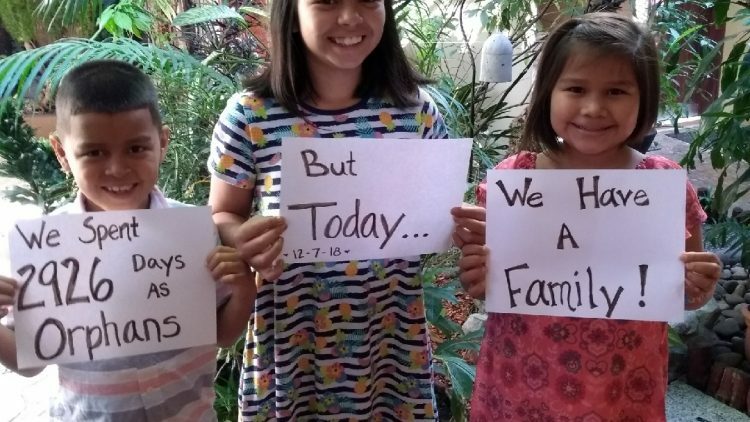 Through the beauty of adoption we recently went from a family of six to a family of nine!! Friday December 7 we officially signed the paperwork in Tegucigalpa, Honduras to give Luis (7), Banesa (10) and Scarlett (12) our last name! They join sibling Grace (14), Maddie (12), Ella (11) and Solomon (9). All nine of us have been staying at a hotel in Honduras since October 21. Due to a scheduled holiday shutdown of almost a month by the Honduran Government we will not be able to complete our paperwork to obtain Visas for the children and return home until mid January. Our friends, family and even strangers have been very supportive during the adoption process both prayerfully and financially! Unfortunately because of the unexpected, extremely long in country stay we will need more help in both prayers and finances. If you are able to help us in either or both areas so that we can concentrate on blending our family and doing the hard work of rebuilding the hearts of children from hard places, it would be so appreciated! Many prayers and blessings going to you and your family! We would love to meet you all when you get settled back here.